I made the mistake of looking on Topshops website & now I have fallen madly in love with 2 pieces of clothing! Good news is that it is pay day tomorrow, bad news is that I am still sticking to my ‘I must never buy any more clothes ever again unless they are extremely cheap in the sale’ resolution! I am pretty sure you all know by now how crazy I am about kimonos, right? 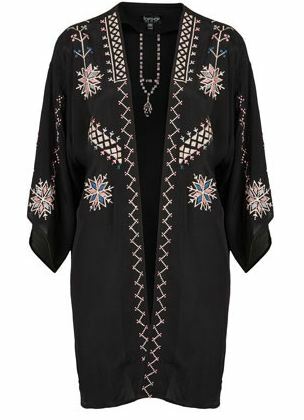 Imagine my how I felt when I spotted this Aztec Embroidered Kimono, my heart skipped a beat. Sadly it is £58.00, I must resist, I really must! Next I fell in love with this little beauty! I love colours, especially when they are mixed together in some crazy form. Obviously this little number is top of my wish list right now. 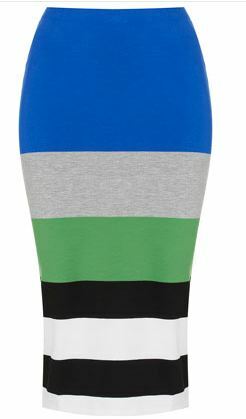 This Colour Block Stripe Tube Skirt is a little more on budget at only £22.00 but again, I must resist! It is so difficult to stop spending on things you like the most, I feel your pain!